In my PhD thesis I am particularly interested in how anthropogenic landscape modification influences bat diversity, changes virus prevalence and alters transmission in bat-virus systems. 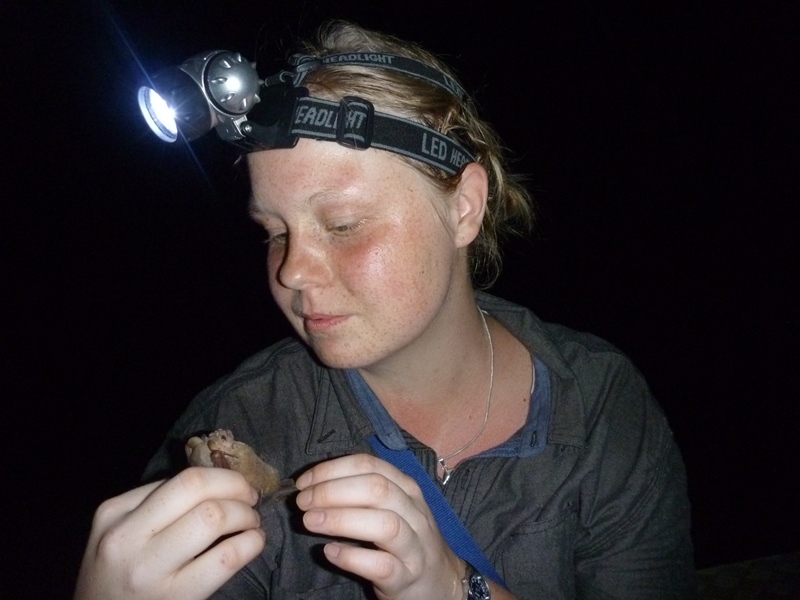 My research focuses on the population genetic structure of six phyllostomid bat species (Artibeus jamaicensis, Dermanura watsoni, Carollia perspicillata, Glossophaga soricina, Uroderma bilobatum, Trachops cirrhosus) and, therefore, their current and future distribution. I will use individual genetic data to estimate dispersal rates, population genetic structure and effective population size. Knowledge about the population genetic patterns of organisms that are host to infectious diseases is important to make assumptions about transmission of parasites and diseases. Emerging infectious diseases in humans are increasingly traced to a wildlife origin and dispersal routes may be important pathways for transmission of these pathogens. This knowledge will allow appropriate management for conservation and the prevention of disease spread and virus transmission. Halczok, T., Brändel, S.D., Flores, V., Puechmaille, S.J., Tschapka, M., Page, R.A., Kerth, G. (2018): Male-biased dispersal and the potential impact of human-induced habitat modifications on the Neotropical bat Trachops cirrhosus. Ecology and Evolution 8: 6065-6080. Halczok, T., Fischer, K., Gierke, R., Zeus, V., Meier, F., Tress, C., Balkema-Buschmann, A., Puechmaille, S. & Kerth, G. (2017): Evidence for genetic variation in Natterer's bats (Myotis nattereri) across three regions in Germany but no evidence for co-variation with their associated astroviruses BMC Evolutionary Biology 17:5 DOI 10.1186/s12862-016-0856-0.